When the Mount Duneed Cemetery was established in Cemetery Road (now called Williams Road), the nearest cemetery was at Mount Moriac (known as Duneed Cemetery). Peter Mansfield in his book "Barwon Cemeteries" states that the first recorded burial at the cemetery was on 23 October, 1864.​ According to cemetery records there were some early burials, some before the cemetery was gazetted. The first was John Doherty. Other early settlers buried here were John Harkness (1864) who was killed on the main road when his vehicle overturned after striking a heap of road metal, Agnes Mackenzie (1794-1883), the mother of John Mackenzie of "Ghazeepore" and Deborah Brien (1796-1883). The earliest born was John Ford (1787-1870). This cemetery in Church Street Grovedale was once named Germantown Cemetery. It was next to the first church built in Germantown on land donated by Samuel Roehr. It had mud walls and a grass roof. The first church service was on 24 June 1854. The cemetery is of historical importance for its association with the first German Lutheran settlers who came to Australia in the 1850s. They had been brought to Australia by Dr Alexander Thomson to be employed by him as vine dressers. In 1849 four Prussian families who sailed in the Emmy were Bieske, Baensch, Winter and Kerger. Later families were Andressen, Rossack, Kosseck, Hartwich, Pacholke, Renzow, Heyer, Schultz, Baum, Monn, Jasper, Lorke, Schneider, Herman and Klemke. Many of them occupied one acre properties near Waurn Ponds Creek. A memorial to these settlers was established as a centrepiece to a small rose garden. Many of the old headstones in the cemetery have inscriptions in German. Some of the oldest sandstone memorials have fallen and are in pieces. The first burial was Ann Bieske on 1 January 1855. The Lutheran Cemetery in Anglesea Road Freshwater Creek was established about the same time as the Lutheran Church known as Waldkirck, meaning "the church in the forest". It was a wattle and daub church built in 1859. It was replaced by the present bluestone church, designed by architect Robert Smith Tuffs. The cemetery has historical value as a record of the early settlers in the area. It is listed on the Heritage Register and with the National Trust. This is a rare example of a churchyard cemetery which is still in use. Many of the early inscriptions are in German. The first burial took place in 1860 when eighteen year old Louisa Seiffert died of pneumonia. The first Germans who came to Geelong settled at Germantown (Grovedale) and Freshwater Creek. Until about the mid 1920s this cemetery was referred to as Puebla Cemetery (probably because it was in the Parish of Puebla). ​It was a private cemetery and did not apply for grants or submit annual reports to the government. 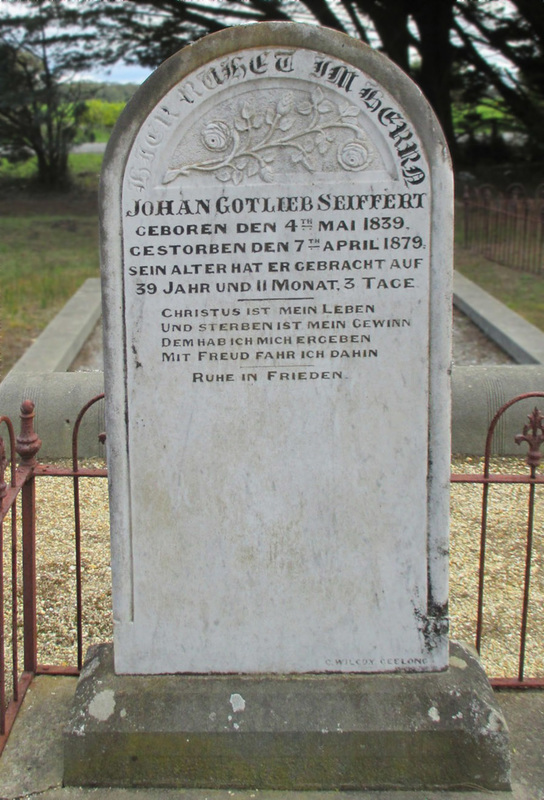 The Charles Wilcox memorial to Johan Gotlieb Seiffert, late of Paraparap, born 4 May 1839, died 7 April, 1879. He was 39 years, 11 months and 3 days. When the Mount Moriac Cemetery was gazetted the name was Duneed (Mount Moriac) Cemetery. As this caused confusion after the Mount Duneed Cemetery was established in 1864, the name was changed soon after to Mount Moriac Cemetery. In 1873 the Geelong Advertiser reported a potato plantation looking very healthy at the cemetery, comparing it to the weeds which luxuriated at the Geelong Eastern Cemetery. In 1882 tenders were called for a 2 room cottage (24 feet by 12 feet) to be built at the cemetery. In 1892 tenders were called for the erection of an additional room to the sexton's house. In 1899 tenders were called for grazing (of shorn sheep only). ​According to the Shire of Barrabool Centenary book published in 1965, an ancient headstone of Robert Glew who died in 1861 records the probably that he was the earliest born of any person interred at the cemetery. He was born in 1778.